My interest in Full Cavaliers of the Order of Glory (which extends back some 15 years) has led me to the following general observations ref the collectors market for Full Cavalier sets that has developed in the United States and Europe over this period. I offer the following as my personal observations and welcome your comments/opinions. 1) Order of Glory 1st, 2nd and 3rd Class medals with accompanying Full Cavalier award booklet that includes photo of recipient, official military commissariat stamp on photo and date when booklet was issued plus all standard entries. 2) Same as 1) above but the photo does not have the official military commissariat stamp and the booklet lacks an entry for date of issue. 3) Order of Glory 1st, 2nd and 3rd Class medals with accompanying Full Cavalier award booklet but award booklet is missing the photo, official military commissariat stamp and date booklet was issued. 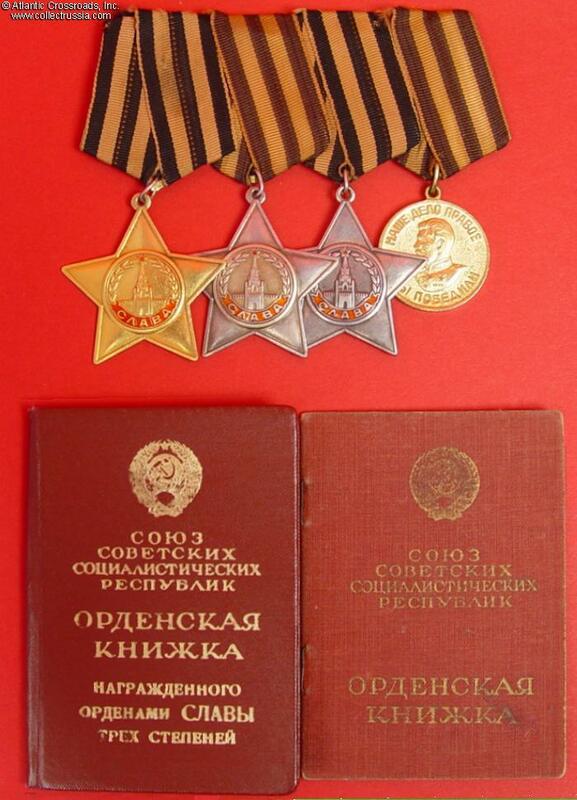 4) Order of Glory 1st, 2nd and 3rd Class medals with accompanying Ordenskaya Knizhka with or without photo. 5) Order of Glory 1st, 2nd and 3rd Class medals with accompanying Voenniy Bilet. 6) Order of Glory 1st, 2nd and 3rd Class medals with research e.g. Special Awards Card for HSU and Full Cavalier and/or Standard Awards Card and/or copies of Glory Award Citations. 7) Order of Glory 1st, 2nd and 3rd Class medals that stand alone without accompanying documentation of any sort. 1) Over the past 15 years I have encountered a few category 1) Full Cavalier sets that also included the associated Ordenskaya Knizhka (OK). These occasions have been far and few between. In those instances where I have seen them, all of the other accompanying awards (e.g. 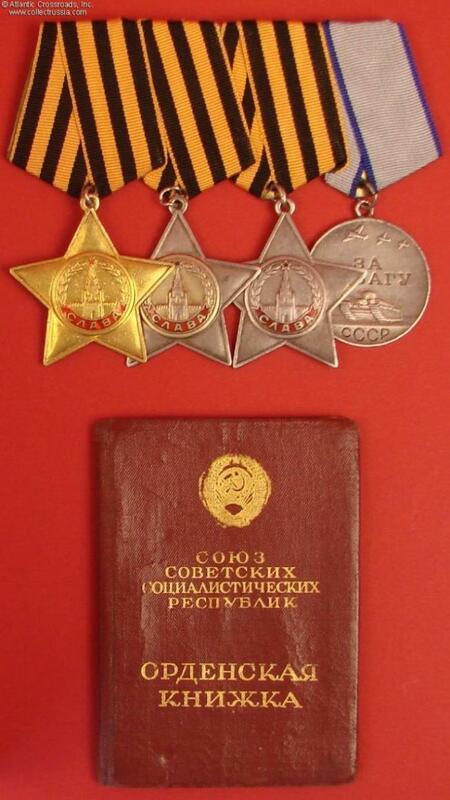 Red Star or Medal for Valor) were never included/available with the set. For this reason, I have not included a separate ranking for category 1) - 3) Full Cavalier sets that might also include the OK since, in my judgment, dealers don't necessarily adjust the price upwards unless the orders/medals identified in the OK are also with the group. 2) The above ranking does not consider Full Cavalier sets that include duplicate Orders of Glory in their make up. While the duplicate(s) may be original in every respect, their presence markedly detracts from the sets' historic/monetary value. BOTTOM LINE: My observation is that dealers' asking prices for a Full Cavalier set generally follow the above guideline. I look forward to your thoughts. I have to agree with your observations. To obtain a Cavaliers set is one of my dreams. One day maybe. It would be the crown jewel of my collection. The above ranking remains valid as of 2 October 2006. It has been quite some time since I've seen a Category 1, 2 or 3 Full Cavalier set on the market. A partial Category 4 set (discussed at http://gmic.co.uk/index.php?showtopic=11402) is the only set I've seen on the market of late. what would be the actual price ranges of the different categories nowadays? How do you see the perspective in the price-movements of "Glory-Trios"? Despite the fact, that a "Glory-Trio" is THE soviet order for personal valour, a russian dealer (located in Europe) told me that summer, that in Russia (the most important market for Soviet awards) the demand is higher for Suvorov's, Ushakov's, etc., than for full documented "Glory-Trios". This russian dealer still trades "Glory-Trios" and had serveral in stock, as he told me. Taken the prestige, history and the rarity into account, the Glory's are from their market value still underrated, I think. What is your opinion about the Glory at the market for Soviet awards? 1) Full Cavalier sets' relative rarity. Beyond the fact that there were only some 2600 Full Cavaliers to begin with, one need simply remember the "golden days" of the early to mid '90s. As Soviet orders and medals began to flow freely out of the East, there were countless instances of original, loose/single Slava/Glory 1st Class orders available on the market. Back then, the focus was more on the gold aspect of the 1st Class than it was on retaining the historical integrity of the Full Cavalier set itself. That said, the true number of Full Cavalier sets is even lower. This fact alone will contribute to continuing price inflation for complete Full Cavalier sets. 2) The Full Cavalier booklet was not introduced until early 1976 - some 31 years after the war ended. By that time a good number of Full Cavalier winners had died reducing even further the number of Full Cavalier sets that may come with the Full Cavalier booklet. I (and clearly the dealers) associate more value to a Full Cavalier set that has a Full Cavalier booklet because the booklet is a form of research in and of itself. In the booklet one normally has the winner's photo as well as a brief synopsis of his unit assignment history given the award authority information contained therein. 3) A given nation's highest military order for combat valor always retains the edge in pricing and collectability. One need only think of the British Victoria Cross and the U.S. Medal of Honor. I firmly believe a Full Cavalier of the Order of Glory set ranks in this category. Bottom Line: My personal recommendation is that if one could own only one (or more) Soviet group of orders it should be an Order of Glory Full Cavalier set. 3) A given nation's highest military order for combat valor always retains the edge in pricing and collectability. One need only think of the British Victoria Cross and the Wehrmacht's Knights Cross. I firmly believe a Full Cavalier of the Order of Glory set ranks in this category. Actually, the HSU is the accurate equivelent to the Victoria Cross, Knights Cross, Medal of Honor, etc. Although having the 1st Class Glory is an impressive feat, it simply meant that three valorous feats were recognized and credited - the feat that earned the Glory 1st was no greater nor less than what earned the Glory 3rd. Although many of the HSU titles were given out for "political" reasons rather than combat valor, I would say that the majority of HSU titles were given for single valourous acts (e.g. look at the numbers for the crossing of the Dnepr, for example.) Thus, the HSU is a better comparison to the other nation's highest valor awards rather than the Glory 1st which was actually a conglomoration of three individual feats and their subsequent recognition. While I do not disagree with Dave's points, one must not overlook the fact that a Full Cavalier of the Order of Glory was accorded the same rights and privileges as a HSU within Soviet society - a HSU and a Full Cavalier of the Order of Glory were equals in this respect. As Dave noted, the HSU was a "Title" and not a "Decoration." Considering the HSU could be awarded for non-combat acts, its pure combat-related nature is diminished - unlike the Order of Glory. The Victoria Cross and Medal of Honor are decorations (not titles) awarded solely for combat valor - pure and simple. That said, my position reference the relative importance/ranking of Full Cavaliers of the Order of Glory remains firm. many thanks for further reveals to the topic of the "Glory-Trios". You are exactly right, there are less cavaliers booklets, than Glorys 1st cl. My remarks to the discussion of the "rank of valour" in comparison to foreign awards. The Glory was the only Soviet award you received ONLY for valourious deeds IN THE LINE OF FIRE! 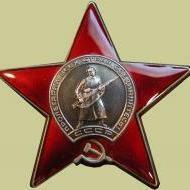 The HSU was not - also comrades, who never saw the front line, i.e., comrade Stalin (but he never wore his HSU), got one - and also the Nazi's Knight Cross was not a pure battle award: How often had been Generalfieldmarshall Keitel ("Lakaitel") at the front? He got the Knights Cross up to the "Swords"-class! So you can compare the Glory only to the British VC. If you look, who got a VC during the battle for the Falklands, then it seems clear, that you can not compare a VC to a Medal of Honor, HSU or Knights Cross. Dave you are quoting the Glory-regulations, that one gets for the same greatness of heroic deed 3rd, 2nd and at the end 1st class of the Glory. That's true and that's the written content of the regulations. But there are quite a few cases, where a NCO or soldier got instead of a Glory 1st a Red Banner, OGPW 1 cl or a HSU (o.k., the effect for the soldier was the same - either Glory 1st cl or HSU ). I think, that there might have been the pratice in some (few) armys to award the Glory 1st cl for a "special" heroic deed in the line of fire. But I think the general line was as Dave pointed it out and I documented it with the case of the heroic battalion during the "Weichsel-Oder-Battle", where ALL soldiers and NCOs got Glorys and some promoted to full cavaliers. Generally it is almost impossible to compare military awards of the same time, but from different nations. There exists a nice small book in russian language - with colour photographs, but in rather bad quality - which documents all the Soviet AND Nazi awards of WW II. But the author doesn't try to compare in ranking the Soviet with the Nazi system. Also consindering the outstanding and pure "Art Deco"-design of the Glory, the simple and direct name "Slava" and the beautiful (traditional) ribbon, the Glory is in my opinion the No. 1 battle award of the Soviets. Now available at a well-known NYC-area dealer. This would be a textbook example of a Category 1 Full Cavalier set were it not for the fact the Order of Glory 3rd Class is a substitute for the original and the Cavalier Booklet lacks a date for when it was presented to the winner. The S/N for the Glory 1st is #11. What is even more uncommon (as noted in post # 1 above) is that the grouping also includes his Ordenskaya Knizhka. what might be the asked price for this set, if the Glory 3cl would be genuine and authentic and if the Cavalier's booklet would have the date, when it was presented to the recipient? The S/N for the Glory 1st is #11. That's funny. I know who used to own this group as I tried to either buy it from him or sell him my two Glory 1st groups (numbers 12 and 13) so that there could be "three in a row." We (unfortunately) were never able to work out a deal. It's interesting to finally see the group though. The ranking in post # 1 above remains valid as of 22 January 2007.
many thanks for your highly appreciated expertise . I assume, that it would be also highly appreciated by the GMIC-collectors-community, if you would share some of your research or of your great "Glory-Trio-Collection" to GMIC . BTW: When are you going to publish your announced comprehensive book about the "Order of Glory"? A very fine example of a Category 4 Full Cavalier set currently available at a well-known NYC-area dealer. This is the first instance I've noted wherein a Full Cavalier set asking price has exceeded $15,000.00 - he is asking $15,500.00. as we all can see: Igor sells his items . The price of the set seems not sooooo high, if you consider the (very) weak USD in comparison to the EURO. But the quality of the Glory 1cl is rather "middle class" and the booklet is - let us say - a bit spoiled and without photograph. At least a full Cavalier set at the market . Which price would now command a Category 1 (one) Full Cavalier set with a Glory 1cl in almost 10/10 condition and a well preserved Cavaliers booklet ? Might such a set hit the USD 20.000,- benchmark ? BTW: With that weakness of the USD the Soviet Awards won't get cheaper for US-collectors . The exchange rate USD : EUR is now almost 1,4 : 1 and had been 0,82 : 1 some years ago . Gone (see post # 14 above). It sure wasn't listed long. as I already remarked in post #15: Igor sells his items . Yes, things priced in US dollars get cheaper every day as the dollar drops like a rock. I wonder, if one of the Glory-trio owners out there really thinks, he will be able to sell his Trio for nearly the same price. And btw, that something dissappeares on CollectRussia does not automatically mean, its sold. There are pieces on conseignment and are withdrawn without being sold. I don?t see the purpose of this thread, honestly. Do you guys really think, your stuff is worth the same now? Who is able and more important willing to spend 15.000 Dollar on a Glory Trio? Not me, even if i had the money. I believe, there are just a handful of collectors, who would do that. Sure, there are the russians, but what, if they are tired of the this old stuff? I have heard Villas in Kitzb?hel are the new hit for rich russians. You can take this as the whining of a poor collector, but i really think, you guys are dreaming, if you think, you can transer the CollectRussia price-level to your collection. I concur - in part. Not everything that "disappears" from that site or similar sites necessarily equates to a sale. In general, however, I do not agree with your assumption that these items don't move - regardless of their pricing. Were that to be the case, dealers of Russian militaria would have disappeared some time ago as lack of demand would have spelled their doom. Neither they, nor others (think WW II German paraphernalia dealers here), would appear to be in jeopardy any time soon. Demand and pricing will always reach a certain equilibrium. As for laying out the cash, there are those in Europe who spend five to six times as much as a Full Cavalier set on high-end cars that lose incredible value the moment they leave the dealership. Go figure. you do collect these and know probably more than me about them, but i just can?t see 15.000 Dollar for a Glory Trio, at least not yet and definately not from collector to collector (Remember the last two Trios, Dave tried to sell?). I don't believe any of us could have predicted the market would have evolved in the manner it has over the past 15-16 years. As with anything else, there are different strata of collectors. Each strata operates within its own financial limits. For those purely interested in financial gain, the margins will still be tremendous if one "got in" early - even if a $15,500.00 (or higher) sales price is not realized. the US-capitalism has won the last battle of the "Cold War" in 1991. We are living in a capitalistic world, where the law of supply & demand is the only law, which counts . For the Russian oligarchs, who have there residences in Austria (nearly all of them are in Austria ), EUR 10.000,- for a Glory Trio are less than peanuts. They spend much more than EUR 10.000,- at one evening in Kitzb?hel . The clerks & assistents of these oligarchs are earning a fortune in sallery and I think, that these are the people, who buy Soviet high-end awards, like a Glory Trio, HSU-set, etc. These folks are very well educated and know the Russian history. Well, I wouldn't sell my Glory Trio for mere EUR 10.000,- and I think, that Igor offered a good price for the collectors in Europe - he sold instantly. A Cavalier of the Order of Glory is something and the prices will go up, up and up - my estimation. I assume, that this had been the last time, that we saw a full Glory Trio for only EUR 10.000,- at a dealer's website . you are speaking about a profit in the 1.000 % + region . If you bought enough high-end Soviet stuff in the early 1990s, then you are a rich man now . I myself missed to buy a Ushakov 2cl and a Kutuzov 1cl for USD 7.000,- each . I traded a silver-head Lenin s/n. 1401 with documents against a pair of unissued Motherland 3cl & 2cl with a faked booklet (a loss of more than USD 10.000,-) .